Worshippers in the sanctuary at Word of Life Christian Center on Queen Street celebrated the 23rd anniversary of the church Sunday during services. The focus was on the future this week as Word of Life Christian Center celebrated its 23rd anniversary at the Kakaako center on South Queen Street. More than 50 congregation leaders, singers and musicians crowded into a small meeting room Sunday to watch the Rev. Art Sepulveda sign a recording and distribution agreement with Aloha Music International, which produces albums of several local artists. "There's a lot of negativity in today's music. People are looking for positive and that's what you give them," said Aloha Music General Manager John Gruhler. He said the church's CD, "Live from Hawaii," will reach national radio audiences through nearly 5,000 Christian radio stations, and even international circulation though Internet podcast sites. At a Tuesday orientation meeting attended by about 200 people, the church unveiled a plan to offer college-level classes in theology, ministry, Christian education and leadership when it opens a branch of Life Christian University here in January. The Tampa, Fla.-based fundamentalist Christian university has 116 campuses in 35 states and five other countries. Those were small crowds for Word of Life, which has a burgeoning presence in the commercial zone of midtown Honolulu. With its 5,500 members attending Sunday and midweek services in droves, and 420 Word of Life Academy students in kindergarten through 12th grade, trooping between the church and classroom sites on South Street and Reed Lane, the church has a high visibility. Area parking lots fill up, and the ubiquitous church logo is seen on circling shuttle buses and vehicle bumpers. Not so high on the visibility meter is the outreach arm of the church, Community Life Resource Center, a separate nonprofit organization, where volunteers serve about 2,000 people each month. They distribute food and clothing to the needy and provide life skills classes, most notably an anger management class filled with people referred by the state courts. The Rev. Art Sepulveda, senior pastor, conducted Sunday services in the Word of Life Christian Center on Queen Street celebrating the 23rd anniversary of the church. 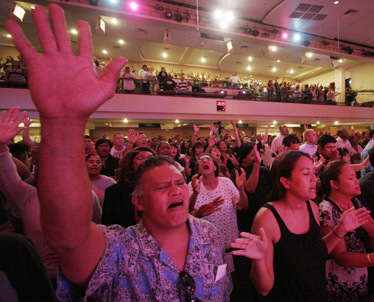 Word of Life is one of the largest evangelical Christian churches in Hawaii, part of the national phenomenon of fast-growing churches outside mainline denominations that emphasize literal interpretation of the Bible and each believer's personal relationship with Jesus. While the other "mega-churches" in Hawaii have denominational or mainland affiliations, WOL is purely the creation of Sepulveda and his wife, Kuna, the associate pastor. 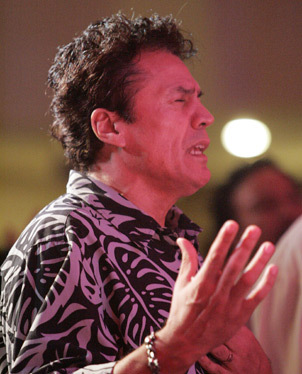 Art Sepulveda preaches at all four Sunday services, and his messages broadcast to WOL branches that meet in Kaneohe, Mililani and Kapolei theaters. Kuna Sepulveda is the heart of the music ministry, a soloist at services and on the new CD and four prior albums. Art Sepulveda said the church has grown "due to a lot of people, not around one personality. It takes a lot of energy; the success is because of the team." They have built up a large staff of assistant pastors, faculty, technical and administration personnel and a cast of musicians and dancers whose talent and repertoire of contemporary praise music cranks up services in the theaterlike sanctuary to rock concert level of audience fervor -- not to mention decibel levels that make it a blessing that the nearest neighbor is a graveyard rather than an apartment building. 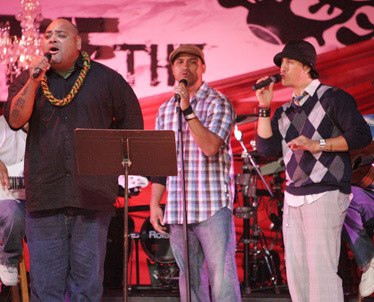 Fiji performed along with Peter Kalei, left, and Tanner Henderson. The pastor spent a little time reminiscing about the beginning, a first gathering at Central Intermediate School that attracted 25 people. He gave up a career with Group 70 architects, and she, an airline communications position, after "God removed the desire to be an architect. It wasn't what he called me to do," he said. "I would park in Chinatown where I saw people going to the peanut butter ministry. I sat with them and opened my Bible to share what I had," Sepulveda said in an interview. "I had a desire to help people. I didn't know what to do for them. When you make a decision and have the constant reassurance that what you're doing is right, you have to follow your heart. "The Lord spoke to me and told me to do these things: Advance the kingdom of God, equip the saints and build up the body of Christ. I said, 'Lord, I can only do it if you bring me the right people.' Equipping saints means to educate people, not just at the level of Sunday school. The WOL Academy isn't just a Christian school holding out for those inside like the Alamo. "We want to attract people, to say that the Christian value system has a big role in this country. We want, in a positive way, to prepare people to penetrate our culture with the word of Jesus." Opening the Life Christian University Hawaii will be the next step. "The university will train evangelists to plant the gospel," he said. "Not everybody is gifted to be a pastor. There is just as much potential to change the world out there by the academics, the professions, the people in the workplace." Sepulveda said the vision for the university is to "bring people here from other nations to learn and go back to their countries. The goal is to reach 44 nations of the Pacific Rim. We want people to go back and impact the marketplace. It's a mission field." Kuna Sepulveda, associate pastor, also sang during the celebration. The church's CD, "Live from Hawaii," could reach national radio audiences through nearly 5,000 Christian radio stations, and even international circulation though Internet podcast sites.